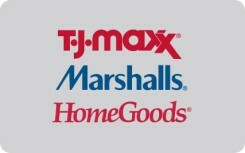 The Marshalls eGift Card is redeemable at over 2,300 Marshalls, T.J. Maxx, and HomeGoods locations nationwide including Puerto Rico and Hawaii. Our team of buyers negotiate amazing deals with designers every day and pass the savings to our customers. Your recipients will find the brands they want for their family and home at up to 50% off department store prices. That's real value. That's every day. Marshalls, T.J. Maxx, and HomeGoods are not affiliated with Swagbucks and are not sponsors or co-sponsors with this promotion. Use of T.J. Maxx, Marshalls, and HomeGoods' names, logos, images, or trademarks require written approval from TJX Incentive Sales, Inc. Participation by T.J. Maxx, Marshalls, and HomeGoods in the program is not intended as, and shall not constitute, a promotion or marketing of the program by T.J. Maxx, Marshalls, and HomeGoods, The TJX Companies, Inc, or any of its subsidiaries or affiliates.